Most people experience some extent of dryness during colder months in many areas of their skin, but for some this often includes dry scalp issues too. Even though it’s common in winter to experience such dryness, it’s beneficial to be aware that there is a difference in having a little bit of dandruff or some seasonal dry scalp and having a more serious scalp issue. It’s one of those annoying things that we all get but presume that it’s ‘just’ another hindrance of the never ending winter blues. However, if you suffer with dry, flaking scalp and usually just assume that it’s dandruff or dry scalp, it is important to know that while they have very similar symptoms, these are two very different conditions. “People generally do not know the difference between scalp conditions and quite often self-diagnose incorrectly,” said Niamh Hogan, CEO and owner of Holos Skincare. According to the holistic health therapist, dry scalp is a lack of moisture which can be caused by various everyday things such as soaps, unsuitable products, the change in the seasons, cold weather as well as other many other things. She explained that in cases of dry scalp, the PH of the scalp changes, the skin gets irritated and causes dry flakes of hair to fall easily from the scalp. These symptoms are easily treatable and more of a nuisance rather than a more serious issue. “It can be treated by using plant oils like coconut, sweet almond or Argan as a mask on the scalp. Rinsing in Apple cider vinegar to balance the PH can also help. It usually disappears with the correct treatment,” Niamh said. However, while commonly thought to be the same problem, dry scalp is not the same as dandruff and is caused by completely opposite things. Dandruff usually occurs in oilier hair as a result of ‘seborrheic dermatitis’ so it is definitely not a dry scalp condition. Experts explain that this can occur anywhere you have oil glands including your eyebrows, armpits and sides of your nose. Niamh stated that there is no known cure for dandruff but revealed that there are many medicated shampoos to treat it to keep it at bay. She also continued said some of the main causes can include poor health, dietary issues and a hormonal imbalance. While it is often misconceived that dirty hair causes dandruff, again this is not necessarily the case. However, Niamh recommends regular washing to keep the hair clean and prevent the buildup of yeast. “Dandruff is often caused by an over production of yeast,” she said. “The yeast can start to feed off the dead skin cells on the scalp and cause them to shed more often than usual. The dead skin can clump into flakes known as dandruff,” she continued. 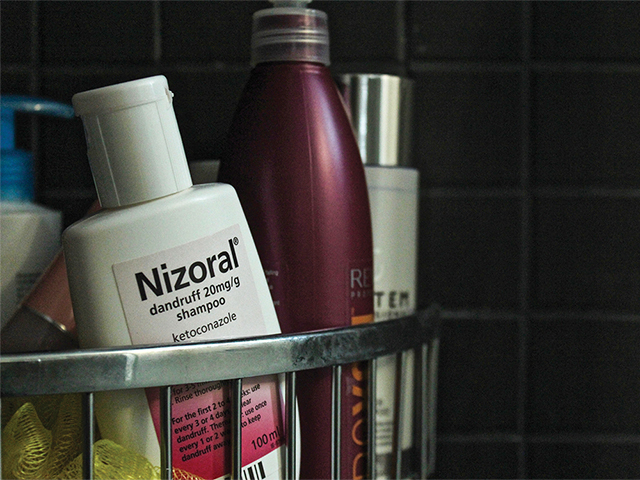 As mentioned, in many cases you can treat the dandruff or dryness yourself with over the counter medicated shampoos. Typically, shampoos such as Nizoral, Selsun, or some of the ones from La Roche Posay, Bioderma or Uriage ‘should do the trick’ according to Dr. Rosemary Coleman, a dermatologist from Blackrock Clinic. However, if after a certain period of time the condition doesn’t improve or begins to worsen, Dr. Coleman recommends making an appointment with your doctor to determine whether it could be a more serious scalp or skin condition. “If you have itch, discomfort, it’s very symptomatic, and it bothers you then you need to go to the doctor to see if you have a more serious cause to your dry scalp. The commons ones are eczema and psoriasis but there are lots of others,” she said. Aromatherapist Niamh further explained that scalp conditions such a psoriasis will appear in patches of raised, often red areas. She said that the cause is unknown but it can often be affected by poor diet, stress and alcohol. “It is much harder to treat and incurable. It is usually managed by eliminating certain foods, alcohol, avoiding stress and products that may irritate it,” she concluded. So, if you are having any dryness, or flaking scalp, spot the symptoms and differentiate between dandruff and dry scalp. Although it may just be the cold weather or stress from exam pressure and assignments causing some seasonal dryness, there could be a more serious problem that requires the recommendations from a specialist or a doctor. Additionally, even though dandruff is incurable, there are ways to prevent it and limit any itchiness or discomfort in the meantime. Washing your hair with anti-dandruff shampoos, rinsing it out properly and avoiding any harsh chemical products can prevent drying out the scalp. Similarly, stay clear of oily hair care products to prevent any oil build up which can cause dandruff. And, of course, while it’s easier said than done, try limit any stress or irritation that can cause a flare up and try maintain a healthy diet. Not only is this the key to healthier hair and scalp, it’s always the key to a healthier body and mind.